MeeZee is a character actor, chair stacker, clown, roaming/ambient specialist and Bboy (breakdancer). 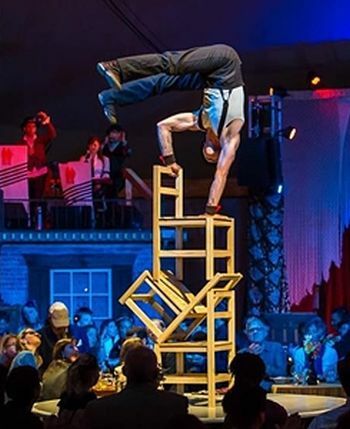 Based out of the San Francisco Bay Area, MeeZee performs frequently with a group that describes itself as having been “spawned from the depths of San Francisco’s thriving dance and circus subcultures”, the remarkable Vau de Vire Society. MeeZee has traveled across the U.S. performing at Detroit’s Theatre Bizarre and on occasion with East Coast based Squidling Bros. Circus Sideshow. We’re looking forward to having MeeZee come, for the first time, to the Moisture Festival and share his brand of Circus entertainment.